I hope the weather is better today than yesterday when it rained most of the day, we had no internet or telephone from Wednesday evening, until Friday morning, so as it is now back on I am scheduling this post just in case it goes again. Our new challenge starts today over at My Time to Craft but this challenge will last for two weeks as for the months of July and August we will be going fortnightly. 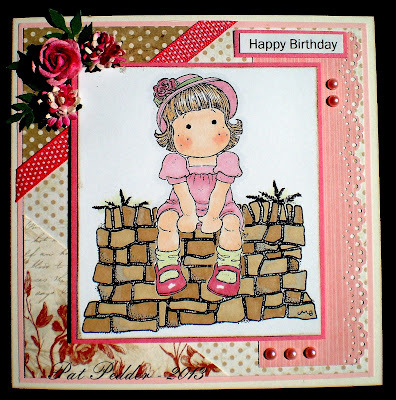 I used one of my Magnolia Tilda images and sat her on a wall stamp which came from a win on Brenda's blog when she was rehoming some stamps, I also added a little foliage with a Clarity stamp. A perfect seat for Molly Pat and a lovely summery card. Aww this is SO sweet Pat!! 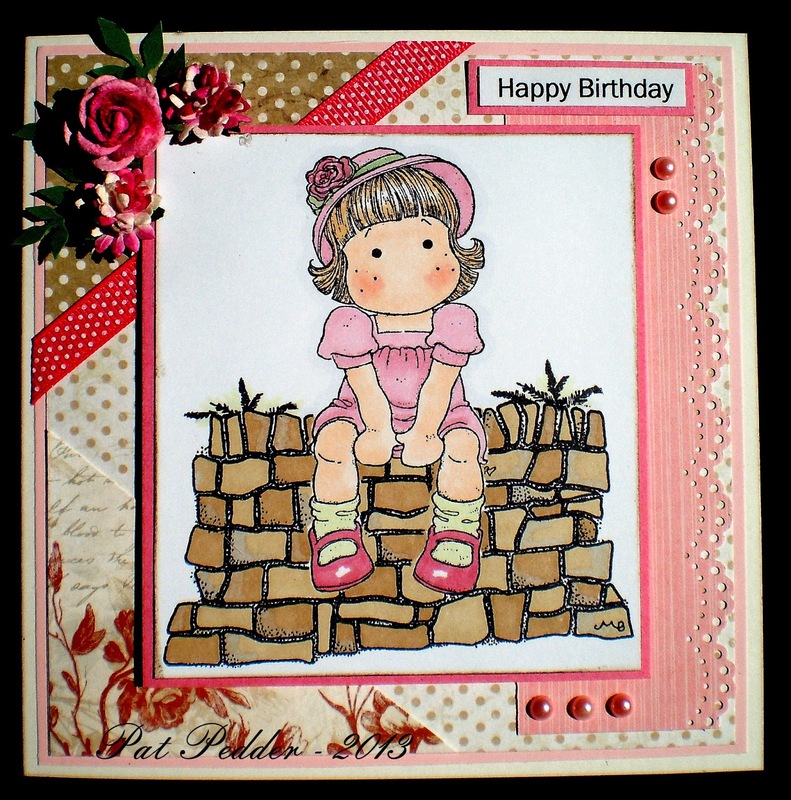 Tilda is adorable and I love how she's sitting on the wall - your masking has worked perfectly!! The papers and layout are gorgeous - I love the pretty flowers and pearls… it's a really fab card! This is so beautiful Pat, I love how you have Tilda sitting on the way. The papers and layout are fabulous. So very pretty Pat! Beautifully designed and colored. You sure have the talent kid! Everyone is talking about rain - we have had a rainy season so far too! Lovely card Pat. Tilda looks great sitting on that wall. Thanks for sharing it with us at Divas by Design. Great card hun, love the colours & images! Fabulous card love the stamp. Thanks for playing along this week at Midweek Magnolia's, hope you will join us again. Pat you did a great job with these images, love your Tilda colours and the wall looks lovely. I was entering my card at Crafting for All Seasons and I saw your lovely card. I just wanted you to know how much I liked it. Beautiful! Love your pics of 'six of the best'!